With the launch of the Ingress software just around the corner, FingerTec has released the Ingress Trial Version for our resellers as well as end-users to test out the software before actually making a purchase. The trial version is strictly accessible only to FingerTec’s Authorized Resellers & Distributors and End-Users of FingerTec only. The instructions below are intended to help you understand the workflow, types of testing environment, and what you need to prepare before you start the test. Multimedia Models: AC100C, TA100C, TA100TC, TA200 Plus. Access Control & Time Attendance Models: Ingressus, Q2i, i-Kiosk 100 Plus, AC900, R2, H2i, R2c. Face Recognition Models: Face ID 2, Face ID 3, Face ID 4, Face ID 4d. Card Reader Models: TimeLine 100, Kadex, m-Kadex, k-Kadex, i-Kadex. Please make sure that the FingerTec terminal you use for testing is listed above. Any terminals excluded from the list will not work with the Ingress Software. Next up, go to Ingress’s trial version page to fill in the request form and submit it back to us. You are required to insert your FingerTec terminal’s serial number for us to generate the trial product key. If you are not using a FingerTec terminal for testing, you are still required to insert the testing terminal’s serial number, and we will process it accordingly. If you do not have a terminal to test the Ingress software, just leave the serial number text box empty and we will provide you with an 8-digit device serial number and the trial product key. We will email you once your Ingress trial application has been approved. You can access Ingress’s trial version page by clicking this link. Once your application has been approved, you may download the Ingress Trial Version software installer here. Unzip the file, right click the installation file and select Run as administrator to prompt the installation. Follow the onscreen instructions to complete the installation. Upon the Ingress installation, it is mandatory to activate the device before you can use it to perform testing. There are 2 ways to activate the device. While adding new devices to the software, tick the checkbox for Device Online Activation. Once the activation is completed, you can see a “Successful Activation” message at the bottom left corner of the window. As mentioned above, if you do not have any terminals to perform testing, please insert the given serial number at the IP Address / URL text box and tick the checkbox for Device Online Activation. Click Add to activate the serial number and then you may start to use the Ingress software for testing. Another way to activate the terminal is in Devices. Click on the device that you want to activate and click Activate Device. 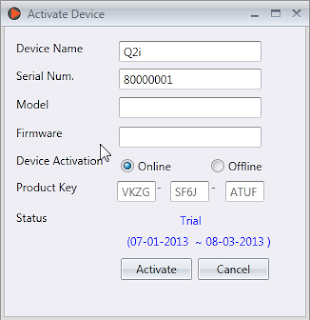 At the Activate Device window, there are 2 methods to activate the device; either Online or Offline. If you choose to activate the device online, select Online and click Activate. The Ingress Software will connect to our database server to verify and activate the device accordingly. You will see the device’s activation status as well as the expiry date. If you choose to activate the device offline, kindly contact us at support@fingertec.com to request for the trial product key. Then insert the given product key into the text box. Select Offline and click Activate to proceed with the activation. Do you guys have a device for automatic call distribution software? Some kind of a router? I actually want to have one at home for the phone. You know, each of the kids' room has installed phone. Thanks for contacting FingerTec Worldwide. For your information, we didn't have device for automatic call distribution software. How can i get an offline activation code for kadex fingertec devices though I have all the products key.